A slouchy, foul-mouthed young comedian and an overwhelmed middle-aged man embroiled in a nasty divorce are unexpectedly brought together when their cancer-stricken mothers become roommates in the hospital. Tensions rise and gauntlets are thrown, but appearances may be deceiving. Through confessions, fights, and uproariously inappropriate jokes, these two unwittingly invest in each other and help to pick up the pieces of their broken lives. A boisterously brazen story of the strength it takes to learn to laugh through pain. NOTE: this play contains strong language and adult situations. Recommended for mature audiences only. Halley Feiffer is a New York-based writer and actress. Her full-length plays also include I'm Gonna Pray for You So Hard, How to Make Friends and Then Kill Them, and Sidney and Laura. She is currently a writer on the Starz series The One Percent. Her plays have been produced, commissioned and developed by Manhattan Theatre Club, Second Stage, New York Theatre Workshop, LAByrinth Theater Company, The O’Neill, The Orchard Project, Berkshire Theatre Group, Naked Angels, Cape Cod Theatre Project, SPACE on Ryder Farm, Keen Company, Partial Comfort Productions and the Amoralists. She is currently working on a stage adaption of The Boy Kings, Kate Losse's memoir about working at Facebook during its rising year. Halley is an alumna of terraNOVA’s Groundbreakers Playwrights’ Group, a former resident writer for Blue Man Group, former Playwright in Residence at Stella Adler Studio and a winner of the Young Playwrights Competition and the Lotos Foundation Prize. She is currently under commission by Manhattan Theatre Club/The Sloan Foundation, Jen Hoguet Productions and Playwrights Horizons. Her work is published by Dramatists Play Service, Overlook Press, Vintage Books, Applause Books, and Smith & Kraus. Halley co-wrote and starred in the 2013 film He's Way More Famous Than You, and co-created and stars in the web series What's Your Emergency for Stage17.tv (both directed by Michael Urie). As an actress, she has appeared in Jon Robin Baitz’ The Substance of Fire, Ethan Coen's Women or Nothing, Kenneth Lonergan’s Medieval Play, the Broadway revival of John Guare’s The House of Blue Leaves, Kim Rosenstock’s Tigers Be Still, HBO’s Bored to Death and Mildred Pierce, and the films The Squid and the Whale, Margot at the Wedding, and Gentlemen Broncos. She holds a BA from Wesleyan University. 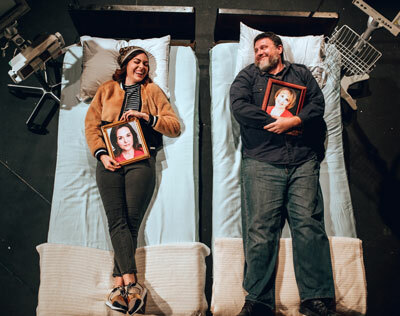 "Stage West keeps pushing buttons with darkly funny, romantic Halley Feiffer play"
Stage West finds laughter in the topic of death in Halley Feiffer's play with a very long title.